Sublingual B12 or B12 Injections? Vitamin B12 can only be manufactured by bacteria and can only be found naturally in animal products, however, synthetic forms are widely available and added to many foods like cereals. 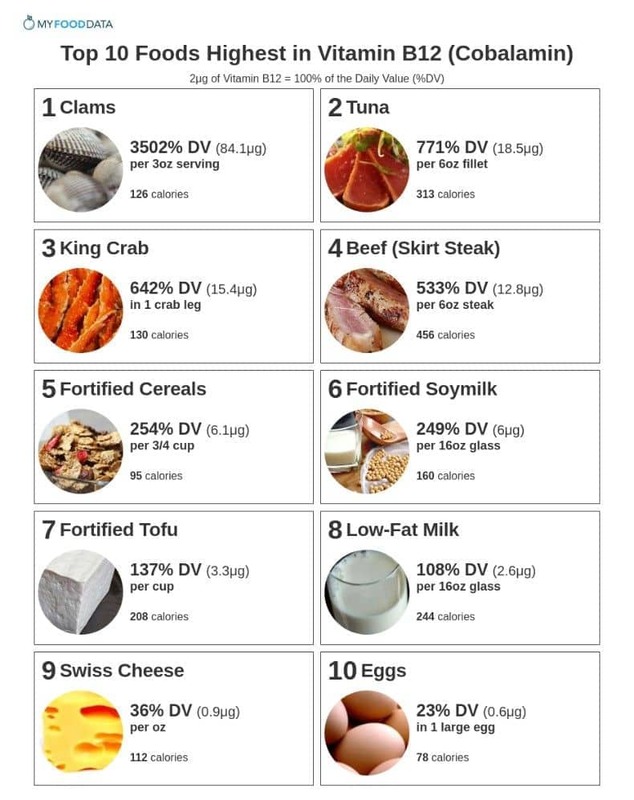 Below are the top 10 foods highest in vitamin B12 by common serving sizes, click here for an extended list of vitamin B12 rich foods, and here for other foods high in vitamin B. If you are vegetarian, see the article on vegetarian sources of vitamin B12. 3oz is equal to roughly 3 oysters, 5 mussels, and 10 small scallops respectively. See all fish high in vitamin b12. See all fish high in vitamin b12, or the list of canned fish high in vitamin B12. See all meats high in vitamin B12. See the complete ranking of 200 cereals high in vitamin B12. See more vegan foods high in vitamin B12. See the full list of dairy foods high in vitamin B12 and the list of vegetarian vitamin B12 foods. See the list of high vitamin B12 cheeses. Eggs are also a high protein food. Vitamin B12 is naturally found in animal foods (meat, cheese, fish, milk, eggs). See our article on vegetarian vitamin B12 foods to find both natural vegetarian foods (milk and eggs), and fortified b12 foods (soymilk, tofu, vitamin water). The recommended daily allowance (RDA) for Vitamin B12 ranges from 0.4 to 2.8μg per day. The daily value for vitamin B12 is 2.4μg per day, which has been recently reduced from 6μg per the USDA food labeling standards. Pregnant women require 2.6μg, and lactacting women should consume at least 2.8μg of vitamin B12. *The amounts for children less than 12 months old is the adequate intake (AI) not RDA. Source: Office of Dietary Supplements. Proton pump inhibitors, such as omeprazole (Prilosec) and lansoprazole (Prevacid), which are used to treat gastric or pepetic ulcer disease can inhibit absorption of vitamin B12. Metformin - often used for type II diabetes, Metformin may interfere with vitamin B12 absorption in certain people. Histamine antagonists, such as cimetidine (Tagamet), famotidine (Pepcid), and ranitidine (Zantac), used to treat peptic ulcer disease, can reduce absorption of vitamin B12 by slowing the release of hydrochloric acid into the stomach. Bacteriostatic Antibiotics, like Chloramphenicol (Chloromycetin), can interfere with the red blood cell response to vitamin b12 supplements. Anticonvulsants - Anticonvulsants have been shown to interfere with vitamin B12 and vitamin B9 (Folate) metabolism. One study found that people taking folate supplements and anticonvulsants experienced a 50% decline in Vitamin B12 blood levels. Patient acceptance of intranasal cobalamin gel for vitamin B12 replacement therapy.